Fuel-efficient, comfortable, and always popular, those are just a few of the many ways to describe the 2018 Nissan Rogue. This crossover SUV offers a roomy and comfortable cabin, seats that you’ll never want to leave, and cargo room that is unparalleled by its competitors. The Rogue can even seat up to seven passengers, making it stand out even further from smaller crossovers that cannot boast the same accommodations. As for the design, the 2018 Rogue is classy and modern, with upscale interior materials, and an exterior that will make people turn their heads. New for the 2018 model year is the optional ProPilot Assist, which is a semi-autonomous system that can brake, steer, and even self-accelerate through dense highway traffic. This model year is also bringing some features to every trim model, such as a second USB port, and Apple CarPlay and Android Auto. What are the trim features offered with the Rogue? There are three trim options available with the 2018 Nissan Rogue. The first of which is the base model S, which offers automatic emergency braking, rear cross-traffic alert, blind-spot monitoring, dual USB inputs, a four-speaker CD player with satellite radio, Apple CarPlay and Android Auto smartphone integration, Bluetooth, a 7-inch touchscreen display, a rearview camera, 40/20/40-split folding rear seats that slide and recline, and 17-inch steel wheels. The mid-range option is the SV, giving you a six-speaker audio system, a leather-wrapped steering wheel, a power-adjustable driver seat, heated front seats, dual-zone automatic climate control, push-button ignition, keyless entry, heated side mirrors, a power liftgate, roof rails, and 17-inch alloy wheels. The highest trim available is the SL which adds an HD radio, a nine-speaker Bose audio system, NissanConnect emergency and convenience services, a navigation system, a surround-view camera system, driver-seat memory settings, a heated steering wheel, leather upholstery, foglights, automatic high beams, 18-inch wheels, emergency braking with pedestrian detection, lane departure warning and intervention, and adaptive cruise control. What are the safety features offered with the Rogue? The 2018 Nissan Rogue comes standard with many premium safety features. Just a few of the notable features include rear cross-traffic alert, automatic emergency braking, and blind-spot monitoring. 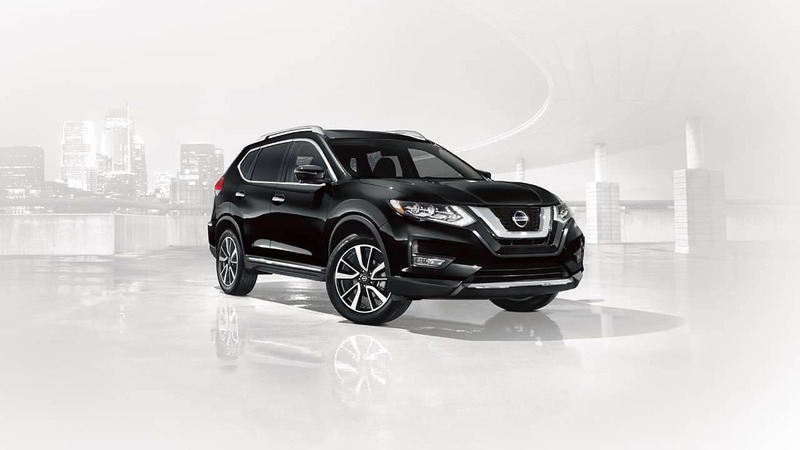 Higher trims offer the NissanConnect emergency and convenience services, a surround-view camera system, lane departure warning and intervention, automatic emergency braking with pedestrian detection, adaptive cruise control, and even ProPilot Assist. What are the engines offered with the 2018 Nissan Rogue? The standard engine in the Nissan Rogue is the 2.5-liter inline-4 that produces 175 lb-ft of torque and 170 horsepower. This engine can be paired with either front-wheel drive or all-wheel drive. The fuel efficiency of this engine is 26 mpg city and 33 mpg highway with front-wheel drive and 25 mpg city and 32 mpg highway with all-wheel drive. There is also a hybrid option, a 2.0-liter inline-4 that can generate 176 horsepower. This hybrid engine can get up to 33/35 mpg with front-wheel drive, and 31/34 mpg with all-wheel drive. Both engines work with the Xtronic continuously variable automatic transmission with driver-selectable. The 2018 Nissan Rogue gives you everything you could want in an SUV, with an impressive standard engine, a large number of premium safety features, and a style all its own. Still wondering more about the Nissan Rogue? Ask any questions you may have by using the form below or calling!